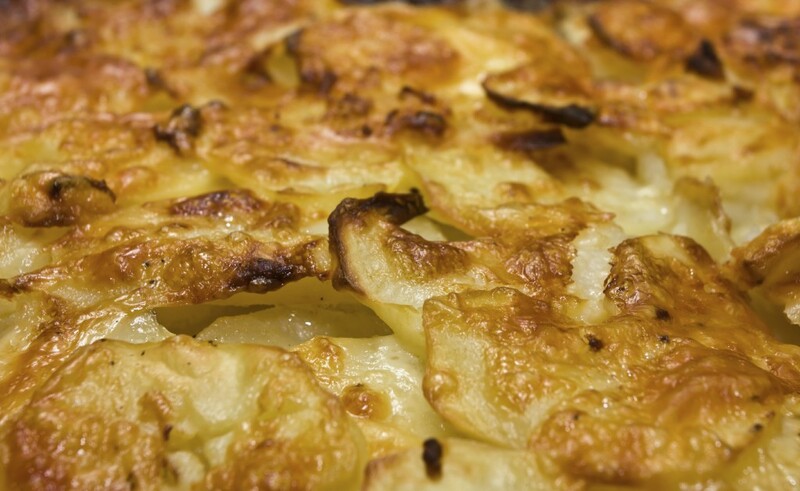 Roast potatoes are a traditional Maltese dish, particularly for a Sunday; it is sometimes cooked on its own to accompany another dish, or sometimes it is roasted together with onions and a cut of meat. In this recipe, the meat is cut into bite-sized pieces and the lot is cooked with mushrooms. Place flour in a large bowl and add salt and pepper. Add pieces of beef and coat lightly. Heat half the butter and oil in a large frying pan on high heat. Add a quarter of the meat to the pan and stir until browned all over. Transfer to a plate and repeat the process with the rest of the meat. Clean the frying pan, add the rest of the butter and oil and heat on moderate. Add the onions and fry for 3 minutes, then add the mushrooms and fry for 3 more minutes. Add the speck or bacon and the garlic and continue to fry for 2 more minutes. Add the meat to the onions and pour over the wine, the stock and the tomato paste; stir. When the mixture comes to a boil, remove from heat and add the bay leaf and sprigs of thyme. Transfer the mixture to an oven dish. Cover with foil and bake for 2 hours. Remove the dish from the oven and increase the temperature to 200°C. Add salt and pepper. Combine the melted butter, garlic and thyme leaves in a bowl. Add the potatoes, salt and pepper and mix well. Place the potatoes on the meat and sprinkle with salt and pepper. Place the dish in the oven once again and bake for 30 minutes or until the potato is cooked and browned to your liking. Serve with boiled green beans.